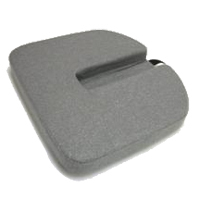 The MybTec 360° Seat Movement Module from Mey Chair Systems is a unique product that enables users to move away from static sitting by introducing movement to almost any standard office chair as well as many other seats. The MybTec Module is located directly below the seat, enabling the seat to tilt up to 15° from vertical in any direction. Users are able to achieve movement by even slight shifts of weight. The tension adjustment lever lets each user choose the level of resistance required to achieve the desired effect. The modular design of the MybTec360° permits the module to be added to either an existing or new chair. The module fits directly over the top of the standard gas cylinder and the seat is then mounted over the top of the MybTec360° Seat Movement Module. The standard height adjustment release lever continues to function as normal. 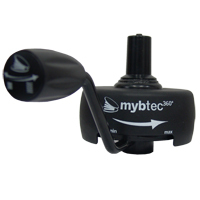 Heavy duty steel construction ensures the the MybTec360° can provide many years of reliable movement. Note: It should be noted that installing the MybTec360°ree Seat Movement Module will change the seat height adjustment range - raising the Minimum and Maximum heights by about 3". This needs to be taken into consideration when determining the suitability of the Seat Movement Module for any user. If the seat will no longer be able to lower to a suitable height the user may require the addition of an appropriate height footrest to provide suitable support for the feet. As a "Seat Only" model the Executive RX Seat is designed for chairs that offer good back support but lack a comfortable seating surface. This modified seat is designed to fit larger chairs and to provide a higher degree of cushioning than most of the other Sacre-Ease models. 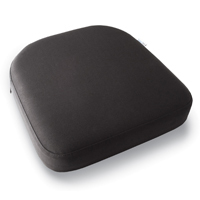 The seat is both wider and deeper than other models to better fit larger chairs and the 2" thick poly foam cushion provides firm support across the entire seat. 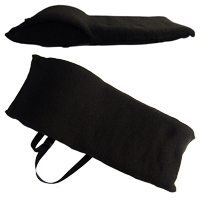 A 3.5" wide x 11" deep "foam-free" Coccyx cutout provides pressure relief for those suffering from tailbone injuries or other conditions that generate similar sensitivity to pressure. The Executive RX is built on a 17" x 17" steel frame, with shock absorbing rubber band support and a full two inches of poly foam cushioning, all covered with a breathable, durable fabric. The non-skid underside keeps it firmly in place on the chair. Like other Sacro-Ease Seat Supports, the Executive RX Seat has a carry-handle, and can be used in virtually all seating situations. 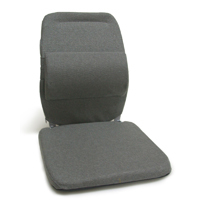 This modified seat is padded with a 1" thick layer of Comfort Memory Foam and features a 2.5" wide x 9" deep "foam-free" Coccyx cutout that provides pressure relief for those suffering from tailbone injuries or other conditions that generate similar sensitivity to pressure. 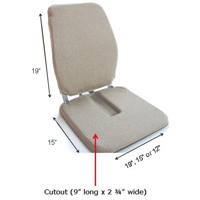 The 15" W x 15" D seat will fit the majority of chairs or vehicle seats. As with other Sacro-Ease models, this Coccyx cutout version includes the primary steel base and rubber band structure with a cover of high quality durable upholstery. The Beverage Holder Accessory from Mey Chair Systems gives GIGCHR users a convenient way of keeping a beverage up off the floor and within easy reach. 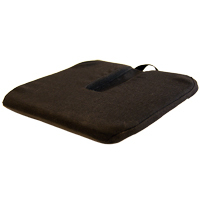 This accessory can also be used on the MVMNT Foldable Sit-Stand Saddle Chair and the FYLDST Folding Sit-Stand Stool. Note: Installation of the Beverage Holder Accessory requires the purchase of the Double Adapter Accessory Mount (90007) which can accommodate two separate accessories. The Guitar Stand Accessory from Mey Chair Systems provides GIGCHR users with a convenient way of keeping their guitar safely supported without the requirement of a separate guitar stand. 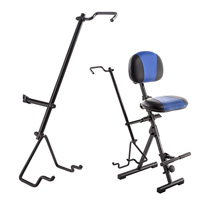 This accessory can also be used on the MVMNT Foldable Sit-Stand Saddle Chair and the FYLDST Folding Sit-Stand Stool. Note: Installation of the Guitar Stand Accessory requires the purchase of the Double Adapter Accessory Mount (90007) which can accommodate two separate accessories. 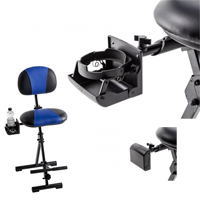 The Double Adapter Accessory Mount from Mey Chair Systems provides GIGCHR users with a means of mounting either one or two of the available Guitar Stand and Beverage Holder accessories. 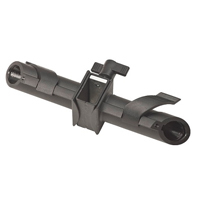 This adapter can also be used on the MVMNT Foldable Sit-Stand Saddle Chair and the FYLDST Folding Sit-Stand Stool.